More than a week ago Cathy Derecki and Curtiss Grymala took me through some of the work they have been doing on umw.edu—which has been a multi-network WordPress install for almost a year now. The ideas here build upon this post I wrote over the weekend about aggregating into umw.edu from my personal blog. Now that the campus is getting used to WordPress as the campus-wide publishing platform for our website, it seems high time to start pushing the envelope a bit to see if we can’t finally realize a aggregated and distributedly authored web site that truly exposes the work happening around campus for all to see. To that end, I think we’re ready to move umw.edu beyond the brochure that has come to characterize university and college websites more generally. How relevant is that approach in the web-based ecosystem of dynamic information we all exist within? Here at UMW we want to integrate the life’s blood of course blogging, social media, and distributed publishing into the fabric of our university’s website. And based on the development Cathy and Curtiss have been doing we are all but ready to start. You can see an example of what they are ready to roll-out this Fall below. 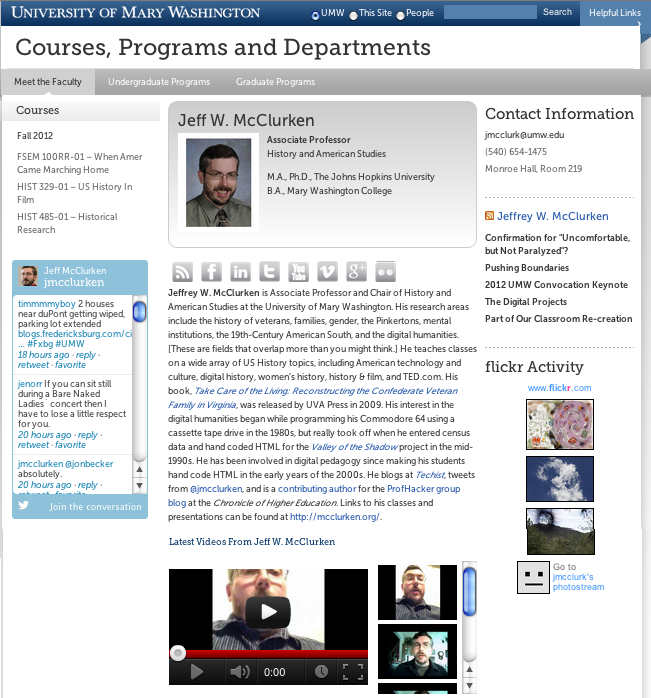 Notice the links to UMW Blogs courses, YouTube, Twitter, blog posts, Flickr, etc. What’s nice about this is that it’s all being automatically aggregated together based on an individual user’s profile page. It is a self-service approach that gives each user control over what social media they want to share, if any. What’s more, Cathy and Curtiss are also working on aggregated discipline-specific pages that will feature the work happening across various courses in a discipline on UMW Blogs (or whatever platform they use),Facebook, Twitter, etc. What’s powerful here is that we can actually create a series of aggregated landing pages for departments automatically and then re-syndicate that into an uber-aggregation piece of the work happening across all the disciplines at UMW—how would that be for a university homepage?! I think this is truly groundbreaking stuff for a university website, why no one is talking about it has to be they just don’t fully understand how awesome it is. We’ve been proto-typing distributed authorship across campus with the Faculty-Staff Newsletter site Eagle Eye and it has worked brilliantly—1857 posts in just about two years and a 125 different authors. …schools should be in the business of managing data flows rather than in supporting an end to end user experience. We can only dream what might result if the energy going into the campus-wide LMS’s would go into creating flexible and easy to use “syndication buses” or to addressing pragmatic instructor challenges to using the “small pieces” approach — things like student management tools, gradebooks etc. And what about providing the service of institutional archiving and data backups to mitigate the risks of using third party tools? That remains a montra for us here at UMW, and we are getting closer and closer! 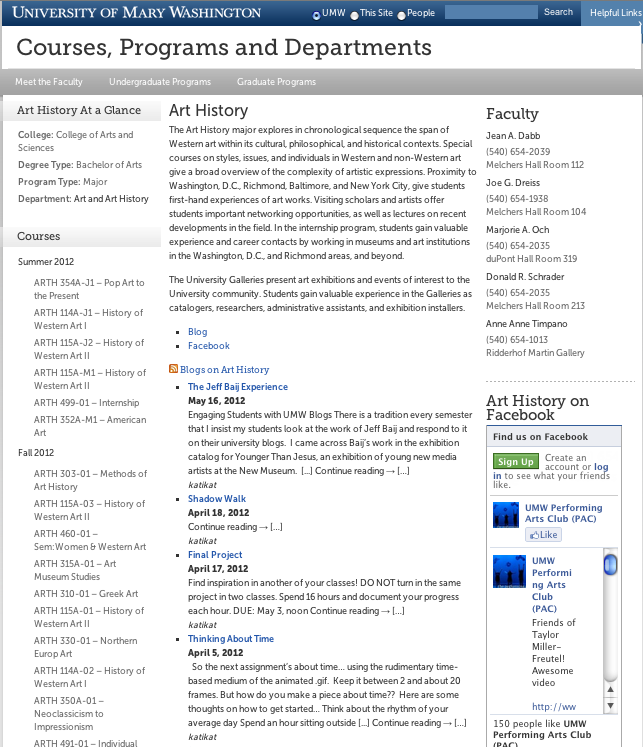 This entry was posted in umw, UMW Blogs, umw.edu and tagged aggregation, syndication, umw.edu, umwblogs, WordPress. Bookmark the permalink. This is great. Have Cathy and Curtis written up the tech for this? Not to speak out of turn, but we’ve been talking about these types of enhanced profile pages on the Commons for a while. Again, what’s awesomest is the buy in you have from the community and the willingness to generate content that flows… for what good is a place to plug a feed if there’s no feed to plug? This is awesome! Way to go Cathy and team. I think the challenge in adopting this approach for many schools is that it means giving up control over web content to departments, faculty and students. The idea of the college website as a marketing tool instead of an information tool requires keeping a tight rein on content – not an easy job with so much syndication. I do think there needs to be some serious documentation of this stuff by Cathy and Curtiss, and soon to be Alan Levine as well jumping in here. Sorry to suggest that we invented profile pages, I guess what my angle on it was that we are doing this as part of our school’s website, not a pre-defined social networking site outside of that context—does that make any sense? I recently signed-up for an account on the CUNY Academic Commons and it was smooth as silk, and an amazing way to frame those profiles—a bit of a difference for us is we aren’t using BuddyPress. The reason being I still don’t know if the overhead of BuddyPress’s complexity is worth it for us—-forums and groups can only get me so excited. I agree with you 100%, it is all about giving up control, but what was interesting in the EagleEye model is that it actually worked well—and I think that helped prime the pump. More than that, I think distributed authorship and trust is a great way to run a website. Jim – Thanks for taking the time to post about this. I’m really psyched about the idea, too; and am really hoping we get great buy-in from the faculty. The possibilities here are endless. Luke – Yes, we did code this from scratch, rather than using something like BuddyPress. There are a number of reasons behind that; first and foremost being that we are using Banner (Active Directory) data to dynamically build the list of users in the first place, then piggy-backing off of that Banner data to build out the WordPress user profiles. If someone has a WordPress user profile that isn’t an active faculty member (determined by whether they taught a class last semester or are teaching a class this semester or next semester), they won’t show up in the list. 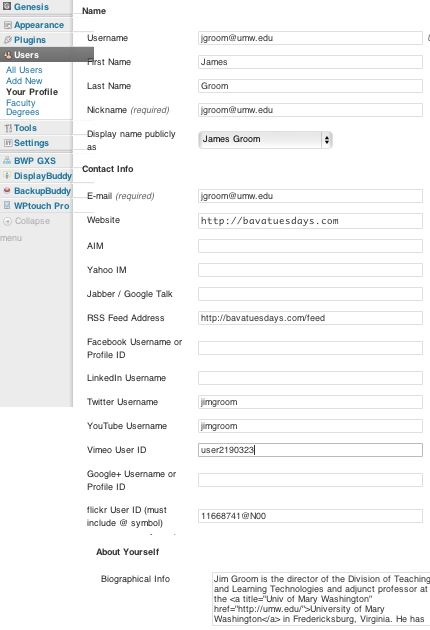 If someone is an active faculty member, but doesn’t have a WordPress user profile, they’ll show up in the list, but the data shown on their specific profile page will be very limited (and we’ll automatically create a WordPress user account for them to build out when they have the opportunity). It’s all tied directly into the authoritative list of courses being taught at UMW, we’re just using WordPress to flesh it out and make it easier for people to manage their data. At any time, you can look at the code I’m developing (for this plugin or any number of other plugins specific to my work at UMW and freelancing) by checking out my Subversion repo at http://svn.ten-321.com/. 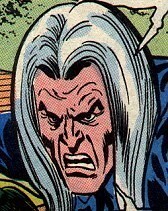 This particular plugin is the “UMW-Faculty-Course-Listing” entry in the repo. Eventually, once we have the tech ironed out and are comfortable with the way it’s being adopted, I definitely plan to sit down and write out detailed documentation on the subject so that others can pick it up and adapt it for themselves (I’ve been purposely trying to code it in such a way that it can be easily extended and so that people can pull out our AD data requests and replace them with their own – for instance, others won’t be able to, or want to perform the SOAP requests we’re performing to get the list of courses from which we build everything else). As always, let me know if you have any other questions about it, or if you want to chat some more about it. Thanks.